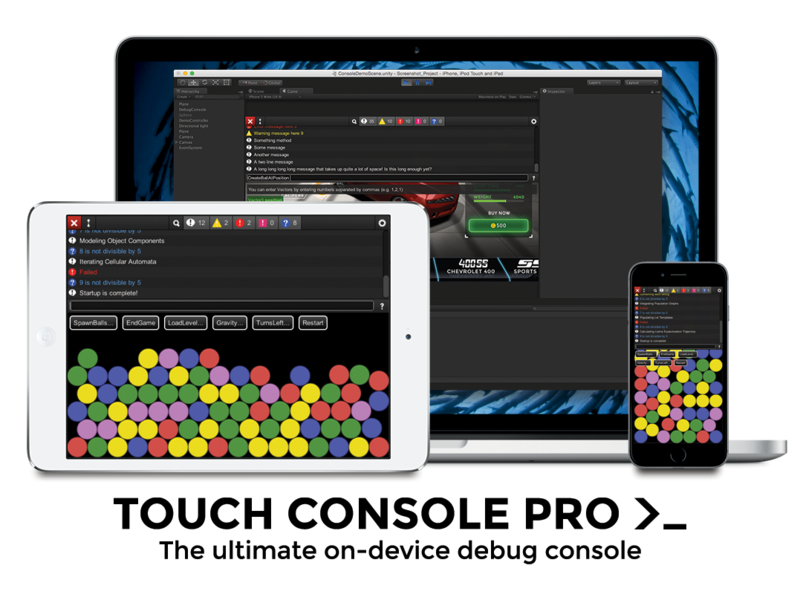 TouchConsole Pro is a fully featured, extensible debug console for Unity. It's been designed to be enjoyable to use on mobile, desktop and in the editor. It's based closely on a console that's been invaluable in the development in a number of successful mobile games, so hopefully it'll work well for you too! The console resizes around the on-screen keyboard, so you can always see as much as possible of what matters, even if you've only got a few hundred pixels of screen height. It makes sure everything is reasonably sized on whatever device you're using and uses a custom GUI style that's much more finger friendly. It provides clever auto-complete suggestions of commands and parameters to minimize how much typing you need to do. Users are able to send beautiful, rich console logs via email using native plugins on iOS and Android. These logs optionally also include a screenshot of the game, your save game and extra game information that can help you diagnose bugs. This is invaluable for testers! I've tried very hard to make the TouchConsole Pro a pleasant, user-friendly and functional experience across all devices. If you think there's something that can be improved or a feature you'd like to see, please do let me know!